A duvet cover is an investment. You have probably bought or are looking to buy a quality down comforter or alternate quality comforter and you need to protect that investment. Pollen, dust and impurities can damage your comforter not to mention ruin your beauty sleep. At Aletta Smit we give you the opportunity to create the bed of your dreams. 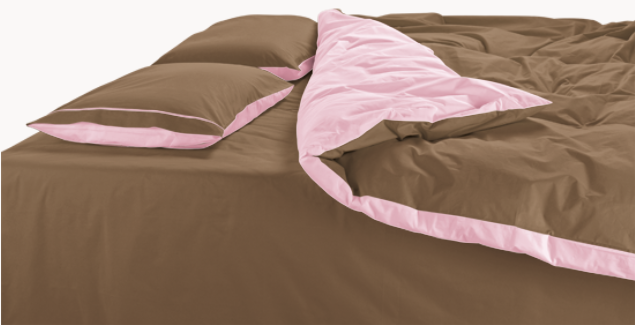 Our two-toned Plain Duvet Covers offer you versitility and a colour palette to match any décor. Luxury is our goal, so not only do we provide bespoke bed linens to fit the style, shape and size of your mattress, we offer superior quality. 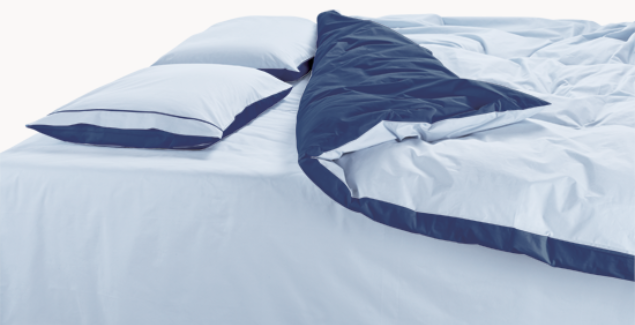 Plain Duvet Covers can not only protect you and your comforter but can also be used during warmer weather to double as a lightweight bed cover. Our Plain Duvet Covers fold flat like a sheet and are easy to store so you can stock up on multiple colors to suit your mood. Let your imagination fly – buy a beautiful Duvet Cover today. First choose the product you would like to order from the main menu. For a Plain Duvet Cover you might want to choose a made to measure 100% cotton percale duvet cover or made to measure cotton sateen duvet cover. Reversible duvet cover and pillowcases with contrasting stitching. The set contains: A duvet cover, two pillowcases (one pillowcase for the single duvet covers). Fabric: 100% pure cotton percale. Reversible duvet cover and pillowcases with contrasting stitching. The set contains: A duvet cover, two pillowcases (one pillowcase for the single duvet covers). Fabric: 100% pure cotton sateen. Here is where you select the colour that fits your décor. 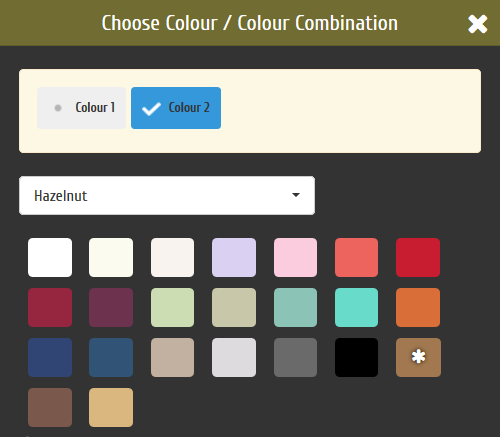 Once you have made your selection the colour will be highlighted so you can decide if it is right for you or if you would like to try another hue. 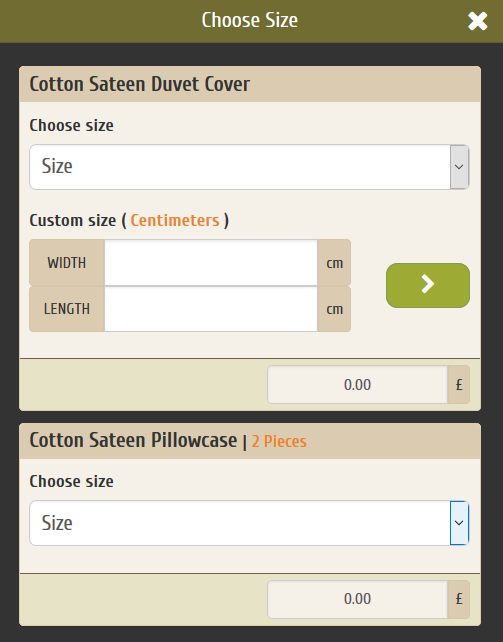 To create a Plain Duvet Cover simply select the same colour for Colour 1 and Colour 2. 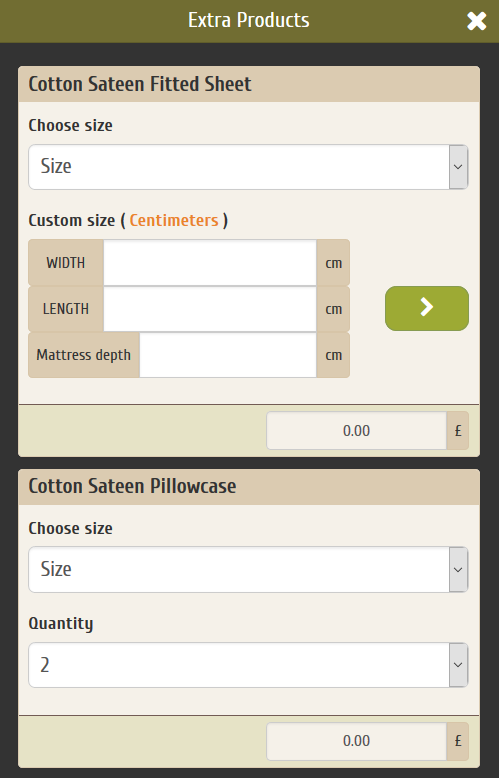 Click on "Choose Size" and in the table you will see standard sizes. In the case of custom sized bed you are given the opportunity to insert the correct size. Keep in mind that the fabrics we use have a maximum width of 280cm (cotton percale) and 300cm (cooton sateen). If in doubt please read our Measurement Guide. By clicking on "additional items" you can complete your plain duvet cover by adding extra pillowcases (sold per piece) or fitted sheets. This step is optional. After you have made your selection of colour and size, choose the quantity of plain duvet covers you would like to order and click on add to shopping bag. You can now proceed with your purchase or continue shopping. 1, 2, 3 easy! All fabrics are made from 100% pure cotton and is the finest available. For more information about our custom-bedding products visit our FAQs page, Measurement Guide and Washing and Care Guide.